The legal department, and related functions, is one of the most critical components governance, risk management, and compliance (GRC) capability. Optimizing the legal department is an important step toward an integrated GRC capability. 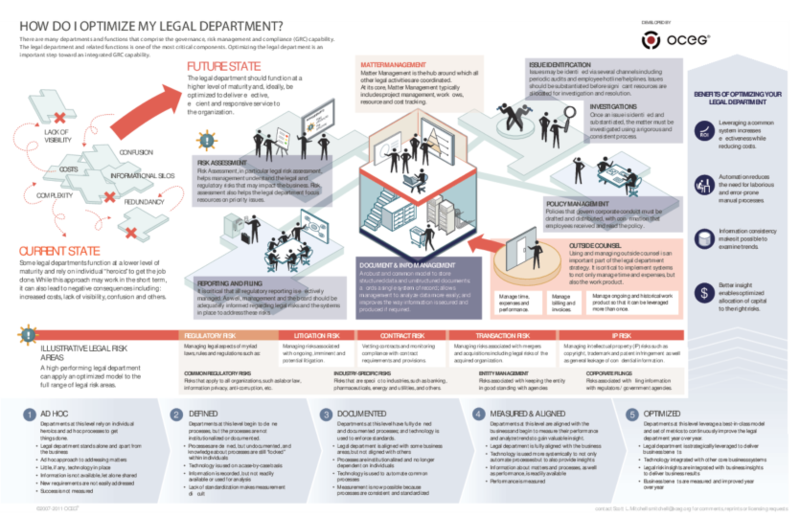 This installment of the GRC Illustrated Series addresses ways to mature the legal department and its role in GRC capability. We have emailed instructions to access Illustration – How Do I Optimize My Legal Department to . Make sure the email arrives in your inbox: either add "support@oceg.org" as a safe sender to your email platform, or if you use Gmail, drag our email into your Primary tab.